For the first of the series, I'm going to talk about my current style crush, I go through so many phases of different people who's dress sense inspires me, But this one seems to be the one I always go to for inspiration. So what if what she wore was the in thing over 40 years ago, Shes one of the true fashion icons in my eyes. 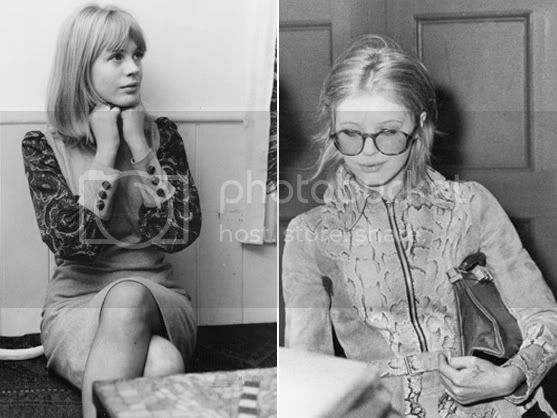 Move over Marilyn Monroe and Audery Hepburn, Marianne Faithfull is my vintage style icon. Marianne Faithfull was the original rock chic. She was Mick Jaggers girlfriend and became quickly became a style icon and musician in her own right. She took risks back in the 60s, when most girls were still in suits and stockings, she was stepping out in leather jackets, heart-shaped sunglasses and feather boas. The thing I most admire about her style, is that her wardrobe at the time was so timeless, She wouldn't look out of place stepping out of a club today. Marianne was the epitome of rock chic cool throughout the 60's. Marianne really had a nose for good style, She knew what worked for her and she stuck with it. Her luxe groupie look has been replicated by people like Kate Moss and have been seen all over the high street and catwalks ever since. ooh, i'm looking forward to this series! it's really refreshing to see how many little projects you're doing, i love reading things which you can tell the writer is totally buzzing about!